There is a new Intel Master Key available now, and it unlocks some pretty awesome extras for those getting a new Intel Core i5 or Core i7 CPU, Gaming PC, or Custom PC featuring these processors. On the code it says it unlocks quite a lot, including VR titles, but we’ve found some additions that don’t seem to be listed anywhere + even more unlocks as we completed the surveys that appear while redeeming the games! First up, to claim your Intel Master Key simply visit your retailers Intel Master Key Redemption Website and register your new hardware to receive your special code. Now that hard stuff is out of the way let’s look at the games it unlocks! Cuphead is a classic run & gun action game heavily focused on boss battles. Inspired by cartoons of the 1930s, the visuals & audio are painstakingly created with the same techniques of the era, i.e. traditional hand drawn cel animation, watercolor backgrounds, and original jazz music. Play as Cuphead or Mugman (in single player or local co-op) as you traverse strange worlds, acquire new weapons, learn powerful super moves, and discover hidden secrets while you pay your debt back to the devil! When you hear a flash of a human voice on the radio, your hopes and beliefs are confirmed – there are still survivors out in the blistering hear of the post-apocalyptic Grand Canyon state! Arizona Sunshine poses a two-fold battle for survival in a VR zombie apocalypse in which players need to navigate both the hordes of zombies coming for their brains and the scorching hear in their desperate search for human contact. Arizona Sunshine is a VR shooter built and optimized for VR from the ground up. Step into the midst of a zombie apocalypse as if you were really there, and defend yourself against enemies close enough to touch. Enabled by the Intel® Core™ i7 CPU, Arizona Sunshine’s physics and particle systems bring zombie mutilation, wind & water effects, destructible environments, and an array of background detail never before seen in VR. Championship Intergalactica! Race, jump, climb, and fly at extreme speeds through crazy-colorful courses and sabotage your competition as you sprint to victory. Innovative Fluid Locomotion mechanics let you attain incredible speed and control in this VR adrenaline platformer. Redout is pure Anti Gravity racing, a tribute to the classic arcade racing monsters. It’s designed to be an uncompromising, fast, tough and satisfying driving experience, soaked in that vertigo that stands at the core of the genre. Conquer a Single Player campaign spanning more than 100 events, 11 game modes and 30 racetracks. Then move on to Online Multiplayer, or challenge a friend in Split Screen. Your opponents will be fast and unforgiving. Ready to challenge the Solar Redout Racing League? Enter Zvezda, a fully interactive re-entry capsule heavily inspired by 1970’s space technology where every switch, gauge, and mechanical bit could be relevant to your survival. Interkosmos is an arcady astronaut adventure in VR. Brace yourself for a rush of hectic gameplay to challenge your inner cosmonaut and a fun story full of twists and Cold War absurdities. World of Tanks is a team-based MMO game dedicated to armored warfare in the mid-20th century. Engage in free epic online tank battles for instant adrenaline-packed action! Take control of hundreds of authentic tanks, from heavy and powerful steel brawlers to light and fast scouts, and engage your enemy on immersive maps. Battle in teams and join 78 million other players worldwide! And these are the additional unlocks we got as we redeemed! Star Trek: Bridge Crew puts you and your friends in the heart of a starship. As officers of the Federation, every action and decision you make together will determine the fate of your ship and crew. Developed specifically for VR, Star Trek: Bridge Crew offers a true-to-life level of immersion in the Star Trek universe. With 60 outstanding playable tracks, classic game mode, campaign mode, and leaderboards, Rock Band VR brings you hundreds of hours of ultimate rock’n’roll simulation! However! It also requires your have the compatible guitar controller. Breakroom lets you use Windows inside VR. You can surround yourself with applications. Work on Photoshop while watching a Youtube tutorial or just watch your favorite movie while playing online poker and browsing Reddit, while sitting on the beach or in a Japanese garden. You can finally use your headset for other things than gaming and free yourself from the limitations of the physical monitor. Turn your virtual reality headset into a multi-monitor system! 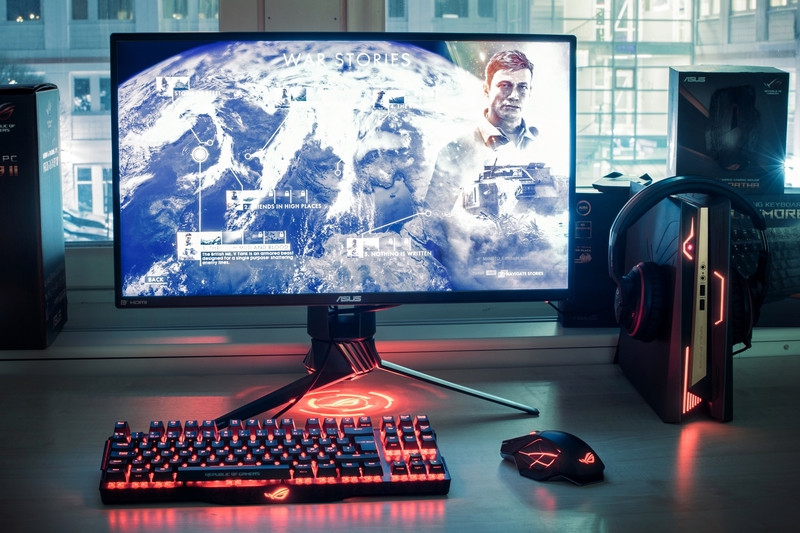 All up, a pretty good haul of games and VR experiences, you can check out the latest in Intel Gaming PC and eligible CPU options here and be sure to keep your eyes on the GGPC Blog for the latest!